It took me awhile to figure things out to decorate and garnish the salmon properly. The very first time I garnished the salmon back 14 years ago, my aerospace engineer husband said, "The scales are on backwards!" What? *cringe* Sure enough, but I did not have the time to re-do it so I took it to the catered party anyway. But the whole time, I just prayed that my hostess and her guests would not notice the backward scales! Now the fish is well chilled, it will be very easy to take off the skin. But first, slice the cucumbers. You will need one English seedless cucumber. No substitution. Peel only half of the circumference of cucumber. Setting the blade of Japanese mandolin slicer to the narrowest setting, slice the cucumbers as thinly as possible. You will need to rotate the cucumber after you run the cucumber down the blade a few times, so you will have round, not oval slices. Cucumber slices should be thin enough to be almost transparent but not torn. Set aside. Note: I wanted to avoid using mayo as many recipes required to glue the cucumber slices. These thin slices will easily adhere to the fish meat. Using sharp edged scissor, cut around the dorsal fin, around the tail, and the head. You want to leave the dark skins on these three parts. Peel off the skin, which is somewhat rubbery and very easy to peel. Taking a sharp blade of the knife, gently scrape off dark fat off the sides. You do not need to be meticulous about taking the fat off. Cut off the two side flaps which were used as the bases to keep the fish upright during baking. Now the tricky part is for you to move the fish from baking sheet to a serving platter. Slide your left hand under the head and toward the middle of the fish while your right hand supporting the tail end. Quickly and carefully transfer the fish onto the platter, ensuring the fish will stay intact. Put all skins and fat remnant in foil and discard. Note: Choose a serving platter that will fit easily in your refrigerator before you transfer the fish. Here is what the fish should look like when the skin is off and fat is scraped. Taking the smaller pieces of thinly sliced cucumbers first, begin adhering the slices starting from the tail end and top to bottom. This way you will not have a fish with scales on backwards. See how the slices with green edge is toward the tail? And don't worry about the slight crack on the body, they will be all covered up. You will need to cut and form the cucumber slices around the head and dorsal fin. 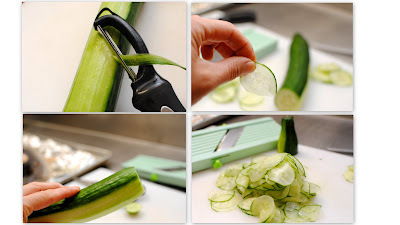 Gently lift the top layers of the cucumber and insert more rounds to fill the gap on the top. Now that I am looking at what I have done in this photo, the cucumber slices could have been spaced a little bit more evenly, but you get the idea. The eyes turn completely white when they are cooked so let's give him some better looking eyes. You you will two whole grapes. Cut the grapes 1/3, discarding the stem ends. Using a sharp knife, take out the white eye balls and insert the grapes in. Gently push the grapes until eyes look somewhat natural. The fish is already staring at you anyway, but we are not having buggy eyes staring, are we? Use Italian parsley, asparagus fern, or any non-poisonous green leaves to cover the base of the fish. Garnish with flowers, lemons, or anything that may go with your party theme. 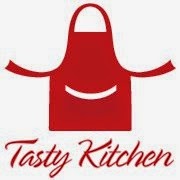 Cover well with plastic wrap and refrigerate until ready to serve. How to serve the fish: After your guests ooh and aah over the fish, take a sharp boning knife and from the top, deeply cut along the just right or left side of the back bone from head to tail. Then from the side, cut perpendicular to the back bone in 1 inch segment. Have a large fish fork available. Well, I hope you will try this at your next party! I begin two days prior to the event because as you know, there are so many details which need to be done on the day of the party. Two days prior to party : Bake the fish and chill. The day before party: Decorate and garnish. Oh my, the patience and skill!! Of course everyone would ooh and ahh. You're very talented! I love this dish and the creativity. Salmon is a weekly dish in our home. Thank you for the tutorial! Love it. The use of cucumbers to imitate scales is brilliant. Wow, way to make that fish look gorgeous! The fish looks stunning! You're an artist! Such a beautiful presentation, and quite the handsome fish. Thank you for letting me know about it. My friend's salmon is in filet form so he can't do this but I am very tempted to make one of these. Maybe I will practice on a trout first! Thankfully, this blog is still here 3 years later. I have been volunteered to do the dressed salmon for our parish picnic on the occasion of our priest's 70th birthday. Hope I can do justice to your tutorial and it won't fall apart in transit. Thanks. Tim in Somerset UK.